In this passage from Hamlet’s famous soliloquy, Shakespeare’s use of the term “rub” likely derives from lawn bowling. A rub is a bump or uneven patch in the smooth surface of the bowling lawn which interferes with the ball’s intended arc. In Shakespeare’s day (1564-1616) lawn bowling was a popular game in Britain. Perhaps the most famous story about the game from that time involves Sir Francis Drake, who was reportedly bowling in Plymouth on July 19, 1588 when word came that the Spanish Armada had been sighted. According to legend he cooly observed that “there was plenty of time to finish the game and thrash the Spaniards too.” Which he did. 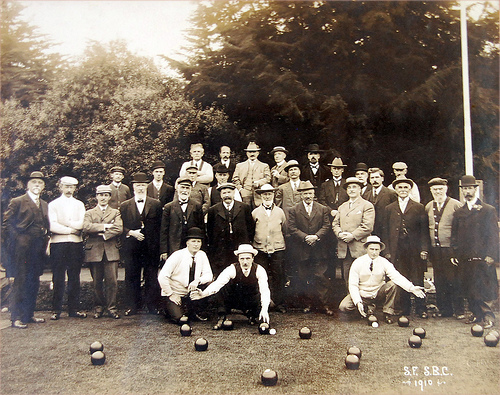 In San Francisco the Lawn Bowling Club dates to 1901. 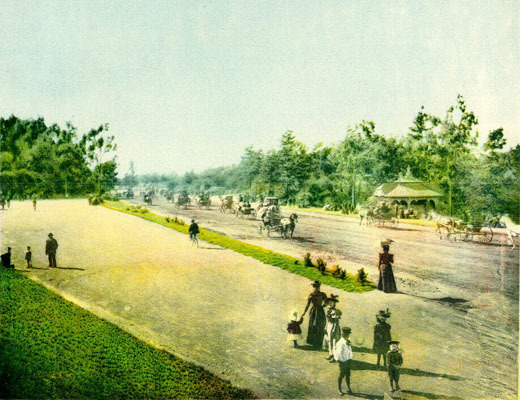 At that time the sport was very popular among Scottish immigrants in the U.S. No doubt the Scottish connection came into play when, in 1902 or thereabouts, John McLaren, then superintendent of Golden Gate Park, found a patch of ground near the Sharon Building, for a bowling lawn. Today, the San Francisco Lawn Bowling Club operates three bowling lawns in roughly the same spot. The club offers free bowling lessons on Wednesdays at noon. No advanced reservations required and it’s great fun! Bill Campbell, Club Instructor, is a gentleman of the old school, soft-spoken and dignified but with a twinkle and lots of anecdotes. If Wednesday noon won’t work, you can call and arrange another time for an introductory lesson: (415) 487-8787. The game is deceptively straightforward. Each player has a set of four matched bowls, each weighing about three pounds. The object is to roll the bowls so they come to rest as close as possible to the jack, a small white ball tossed out between 75 and 120 feet from the bowling plate. The bowls are unevenly shaped, which causes them to curve gently in one direction as they lose momentum. So, to get close to the jack you have to aim to the left or right, depending on whether you are bowling forehanded or backhanded. It’s not that easy! Form and follow-through are important. The condition of the lawn is a factor. Play is governed by old-fashioned rules of etiquette and sportsmanship. A game begins with courtesy handshakes all around. The bowling mat is placed precisely on the lawn and replaced just so on the rail after each round. Divots should be repaired immediately and meticulously so as to preserve the lawn for other bowlers. These touches, not to mention the “whites” that players sometimes wear (for tournaments), lend the game an air of decorum that seems a hold-over from another era. Very much in keeping with the decorous, nineteenth-century setting that the park provides!